The Low-Down: Drone Cops Take Flight In LA. Citizens Aren't Sure They Want Just the Facts, Ma'am. Drone Cops Take Flight In LA. Citizens Aren't Sure They Want Just the Facts, Ma'am. Both the LAPD, star of stage, screen and television, and the less well known but no less powerful Los Angeles County Sheriff's office are experimenting with drones - as are many other police departments. In LA, they are quick to assure everyone that their use is purely for safety and rescue purposes, not law enforcement, with all it implies. At least for now. The only reason the LAPD obtained drones was that the Seattle PD had found Seattleites were clearly and vocally opposed to their implementation. Seattle police were relieved to get rid of them: “SPD UAVs Leave Seattle to Try to Make It in Hollywood,” read a sarcastic blog post on the Seattle P.D.’s own website. Public unease with law-enforcement drone cameras arrives, ironically, at the same time as “overwhelming support” for the use of police body cameras. This discrepancy raises the question of who—or what—can film a city’s residents and under what investigative circumstances. The machine hovered above us, at the edge of a cloud of yellow smoke billowing into the sky from a mock hazardous-waste spill. A member of the Los Angeles County Sheriff’s Bomb Squad stood next to me, watching the scene from a protected space behind a concrete wall. If you don’t know what’s in the smoke, his colleague had explained to me earlier, then you don’t necessarily want to approach with a human-response team. Instead, scenarios like this are perfect for a drone. The aircraft’s four rotors suddenly whirred as it banked to the right to give its remote operator a better view. The ominously colored smoke was now spreading. The morning was overcast, marked by moments of light rain. I had been invited to watch a test run of the L.A. County Sheriff’s Department’s recent acquisition, a quadcopter drone that had been in service for a little more than a year. With its own custom-painted body shell, emblazoned with the single word, RESCUE, in red block caps, the drone looked sleek—cute, even. The Sheriff’s Department made the choice deliberately, to give the potentially threatening technology a Pixar-like approachability.At a time when police SWAT teams have become known for training videos soundtracked by death metal, seeing an aircraft such as this buzzing outside your apartment window might not immediately inspire dread. Somewhere between fight and flight, I realized, there was an altogether different sort of reaction: As soon as I saw this charismatic machine being prepped for takeoff, I took out my phone and snapped a picture. The choice of the word RESCUE was, of course, no accident: It simply compounded the sheriffs’ intended message that this is a tool that comes in peace. My guide for the day would be Commander Jack Ewell from the L.A. County Sheriff’s Department’s Special Operations Division. Ewell’s short-cropped, graying hair and upright physical bearing gave him a military air. Before the morning’s training simulation kicked off, Ewell and I spoke at length about the department’s drone program—although Ewell was careful not to use the word drone. It is an Unmanned Aerial System, he insisted, or U.A.S. Even to refer to its occasional deployment as a regular program would be a journalistic overstatement, he cautioned. The department has—for now—exactly one drone. Over the course of approximately a million service calls in 2017, Ewell said, the department used that drone six times. And out of nearly 10,000 sworn deputies, the largest sheriff’s department in the United States, a mere eight officers are drone pilots licensed by the Federal Aviation Adminisrtation. footage generated by the aircraft; that footage is simply watched live on a remote monitor before being lost to digital history. It is an example of police telepresence—a kind of investigatory action-at-a-distance—in which figures of human authority can attend events where actual bodies might be at risk. This might involve diagnosing a mysterious plume of colored smoke, or it might mean flying to within several feet of an armed suspect under barricade. Indeed, when I spoke with Ewell, that was the exact scenario in which the sheriffs’ RESCUE drone had last been deployed. In March, in the city of Pomona, in eastern L.A. County, an armed motorist allegedly battling depression fled the scene of a car accident and locked himself inside a nearby apartment complex. During a confrontation with police, the man fatally shot a 30-year-old police officer and father of two named Gregory Casillas. The sheriff department’s drone was used to inspect the apartment complex from above; in the process, its clear aerial views into the building allowed law enforcement to see what sorts of materials the man had used in his barricade and how the sheriffs themselves might respond most effectively. Although the standoff would eventually grind its way through another 15 tension-filled hours, the body count never rose. Drones are all the rage today, in everything from experimental street graffiti to wildlife photography. They appeal as much to suburban hobbyists as to NASA engineer. In fact, drones will soon be interplanetary: NASA recently announced a plan to send semiautonomous robot helicopters to Mars. This does not mean, of course, that drone use by the nation’s law-enforcement organizations has been greeted with public enthusiasm. Far from it. Public unease with law-enforcement drone cameras also arrives, ironically, at the same time as “overwhelming support” for the widespread use of police body cameras. This discrepancy raises the question of who—or what—can film a city’s residents and under what investigative circumstances. 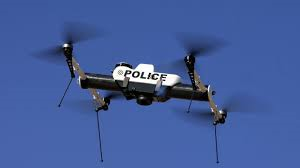 As National Review has pointed out, for example, effective controls on police drone technology must include “limiting the scope of police surveillance, the means of police surveillance, the content police may store, and the length of time for which they may store it. Such limits prevent abuse and preserve liberty.” If bodycams promise that a police officer’s account of an event can now be compared to video footage of what happened, why is future drone footage not greeted with the same evidentiary enthusiasm? For Ewell, the answer is at least partially semantic: When people hear the word drone, he suggested to me, the conversation is basically over before it’s begun. They picture armed Predator airplanes shooting missiles from the sky. Yet Ewell’s alternative phrasing—“UAS”—is both awkward and overly technical, acting as a barrier for broader public acceptance. And so the devices appeal to no one, a small quadcopter drone used for search-and-rescue operations (including locating stranded hikers) having been fused in the public eye with aerial weaponry used to take out terrorist training camps. For Grégoire Chamayou, a theorist and critic of the tools of remote warfare, widespread drone use heralds the rise of what he calls the “hunter-state,” an Orwellian political condition in which everyday life is always under scrutiny from afar by “the apostles of remote control.” Referring to pervasive surveillance programs such as Gorgon Stare, a U.S. military initiative that seeks to record every event in a targeted landscape using semiautonomous aerial-camera systems, Chamayou suggests that drones will facilitate a vast police archive of everyday life—an infinite record of everything that occurs in a city, including the minutest detail of a suspect’s daily activities. Chamayou does not portray this as a revolution in evidentiary case management—as the birth of a searchable public video record of urban police activity—but as a kind of a malevolent detective novel written by the police, in which law-abiding citizens have been recast as unwitting antagonists. Another way of looking at this is that, for now, mission creep is more of a risk than the actual mission. Misuse is often more interesting for critics than a system operating as it should be, but even so, if remotely controlled aerial vehicles become an everyday part of police tactical gear, then opportunities for misuse will become more common. I told Sean Whitcomb of the Seattle PD that a neighbor of mine in L.A. has taken to flying a personal drone around, even sometimes hovering it over the houses on my street, apparently filming things. Perhaps an amateur drone video thus exists of me sitting in my backyard, typing this very article. Whitcomb pointed out that the rise of hobbyist drones arguably presents a larger legal headache for everyday citizens than police use does. There are clearly established legal means for contesting police activities, he suggested, including regular sheriff elections and public oversight over the police department itself. Preventing a camera-happy neighbor from snapping low-angle aerial photos of your home, by contrast, is not so cut and dried. But, Whitcomb said, in Seattle, Los Angeles, and elsewhere, from Connecticut and Nebraska to the United Kingdom, the public has spoken. The LAPD is simply taking baby steps toward deploying their own machines under limited circumstances, and Seattle has no plans for resurrecting the prospect of police drone use. When I asked whether that was a permanent internal ban on using the machines, Whitcomb hesitated. “Who knows what the distant future will hold?” he finally said. As the L.A. County Sheriff’s drone demonstration came to an end, the UAS still had some battery life to kill. When I looked up to find it in the sky, however, I realized that it was too far away to hear, its whirring blades drowned out by nearby road noise, and, because of some large trees lining the horizon, I could no longer see it. It was, for all intents and purposes, invisible. But the pilot knew exactly where it was: He sent it buzzing back into view from behind the treetops, dozens of feet from where I’d expected it to be. It zipped toward the center of a helicopter landing pad, awaiting its next electrical charge and a future mission.